To say that our daughter Sarah loves chocolate is an understatement. For her birthday this year, I made her this cake. She took the leftovers to work and her co-workers had her call me to place orders for their birthdays!! I first made this dessert after seeing it pictured on a cookbook by America's Test Kitchen. It soon became a family favorite. There is nothing very difficult about the recipe, it is prepared in 3 stages. 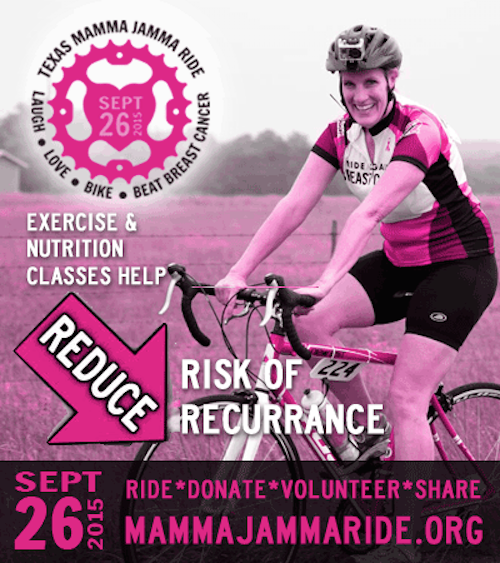 It does take some time to prepare but I promise you, it is well worth the effort!! 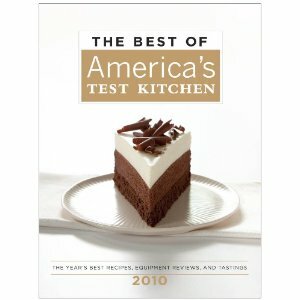 According to America's Test Kitchen, they wanted each layer to have a lighter texture. The bottom layer is a flourless chocolate cake, the middle layer is a chocolate mousse, and the top layer is a white chocolate mousse/whipped cream combination. You will need a 9" springform pan that has at least 3" sides. Preheat the oven to 325 degrees with the rack in the center of the oven. Butter the bottom and the sides of a 9" springform pan. Cut a circle out of parchment paper and lay it in the greased bottom. 1. 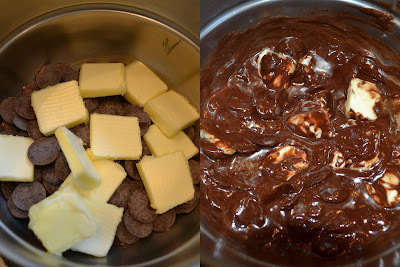 To make the first layer, melt the chocolate & the butter in a double boiler -stirring occasionally. You could also place a heatproof bowl over a pot of simmering water. You do NOT want to get any water into your melted chocolate. (The recipe calls for espresso, but most of my family are not fans of that so I leave it out.) Once it is completely melted, remove from the heat and let the mixture cool slightly, for about 5 minutes. Mix in the vanilla and the egg yolks and set aside. Crumble 1/2 of the brown sugar into the bowl, removing any lumps. Beat about 15 seconds. Add the remaining brown sugar and beat on high speed until stiff peaks form, about 1 minute more. egg whites gently with a rubber spatula until no streaks remain. making sure that the top is smooth. 2. To make the second layer, whisk together the cocoa powder and hot water in a small bowl; set aside. Once again, melt the chocolate in a double boiler or a heatproof bowl set over simmering water, stirring occasionally until smooth. Once melted, remove from the heat and let cool slightly, 2-5 minutes. Then whisk in the cocoa mixture until smooth. Whisk one third of the whipped cream into the chocolate mixture to lighten it. Fold in the remaining whipped cream gently with a rubber spatula until no streaks remain. Gently pour the mousse into the springform pan over the cooled cake and lightly tap on the counter 3 times to remove air bubbles. Gently smooth the top with an offest spatula. Wipe the inside edge of the pan to remove any smudges. Refrigerate for at least 15 minutes while preparing the top layer. 3. To make the top layer, place the white chocolate in a medium bowl. Sprinkle the gelatin over the water in a small bowl and let stand at least 5 minutes to soften. Bring ½ cup of the cream to a boil in a small saucepan. Remove the pan from the heat. Microwave the gelatin for 15 seconds until melted, then whisk into the warm cream and stir until dissolved. Pour the hot cream mixture over the white chocolate and whisk until the mixture is smooth. Cool to room temperature, about 5-8 minutes, stirring occasionally. Whip the remaining 1 cup of cream at medium speed until it begins to thicken. Increase the speed to high and whip until soft peaks form when the whisk is lifted, 30-60 seconds. Using a whisk, gently mix one-third of the whipped cream into the white chocolate mixture to lighten it. Fold in the remaining whipped cream gently with a rubber spatula until no streaks remain. Pour the white chocolate mousse into the pan over the chilled middle layer. Smooth the top with an offset spatula. Do NOT cover, or the white mousse will stick to the wrap. Return the cake to the refrigerator and chill until set, at least 2½ hours. Run a knife between the cake and the side of the pan; remove the side of the pan. Smooth the sides of the cake with a knife if desired. 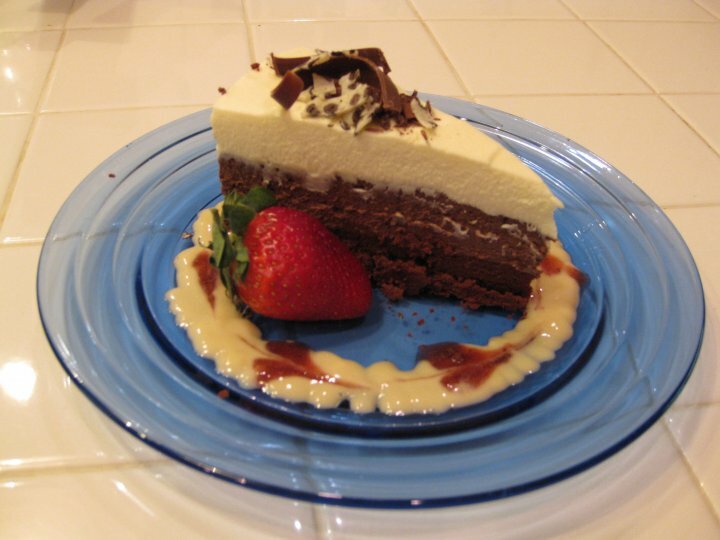 You can garnish the top of the cake with chocolate curls or dust it with cocoa powder. I garnished mine with chocolate shavings, vanilla sauce, a raspberry sauce and a strawberry. 1. Make the Bottom Layer: Preheat oven to 325 degrees F. Butter the bottom and sides of a 9-inch springform pan that is at least 3 inches high. 2. Melt the butter, chocolate and espresso powder (I don't use the espresso) in a large heatproof bowl set over a saucepan filled with 1 inch of barely simmering water, stirring occasionally until smooth. Remove from heat and cool for 5 minutes. Next, whisk in the vanilla and egg yolks; set aside. 3. In a stand mixer fitted with the whisk attachment, beat the egg whites and salt at medium speed until frothy, about 30 seconds. Add half of the brown sugar and beat until combined, about 15 seconds. Add the remaining brown sugar and beat at high speed until soft peaks form when the whisk is lifted, about 1 minute longer, scraping down the sides halfway through. 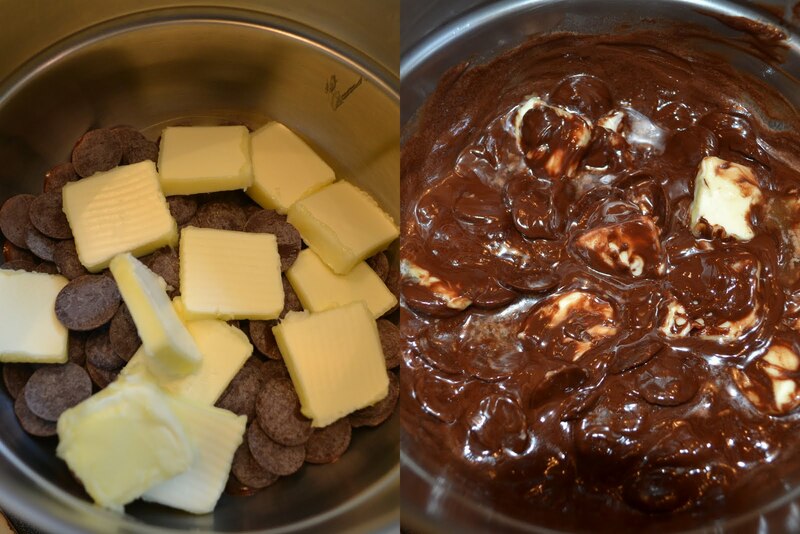 Gently whisk one-third of the beaten egg whites into the chocolate mixture. Using a rubber spatula, fold in the remaining egg whites until no white streaks remain. Carefully transfer the batter to the prepared springform pan, gently smoothing the top with an offset spatula. 4. Bake until the cake has risen, is firm around the edges, and the center has just set but is still soft (the center of cake will spring back after pressing gently with your finger), 14 to 18 minutes. Transfer the pan to a wire rack to cool completely, about 1 hour. (The cake will collapse as it cools.) Do not remove the cake from the pan. 5. Make the Middle Layer: Whisk together the cocoa powder and hot water in a small bowl and set aside. Melt the chocolate in a large heatproof bowl set over a saucepan filled with 1 inch of barely simmering water, stirring occasionally until smooth. Remove from heat and cool for 5 minutes. 6. 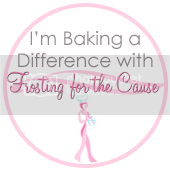 In the bowl of a stand mixer fitted with the whisk attachment, whip the cream, granulated sugar and salt on medium speed until the mixture begins to thicken, about 30 seconds. Increase the speed to high and whip until soft peaks form when the whisk is lifted, 15 to 60 seconds. 7. 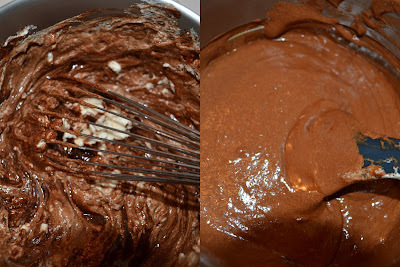 Whisk the cocoa powder mixture into the melted chocolate until smooth. Whisk one-third of the whipped cream into the chocolate mixture to lighten. Using a rubber spatula, fold in the remaining whipped cream until no white streaks remain. Spoon the mousse into the springform pan, over the cooled cake and gently tap the pan on counter 3 times to remove any large air bubbles; smooth the top with an offset spatula. Refrigerate for at least 15 minutes while preparing the top layer. 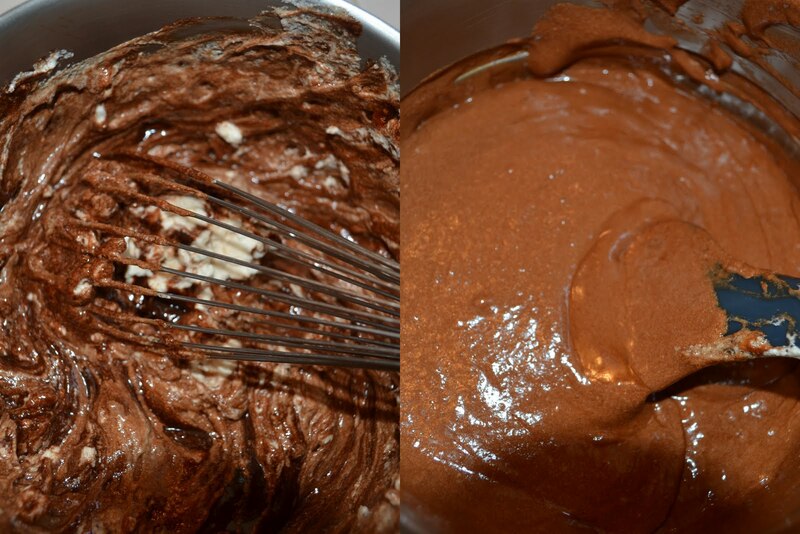 whisk until the chocolate is melted and the mixture is completely smooth. Cool to room temperature, stirring occasionally, 5 to 8 minutes (the mixture will thicken slightly). 9. In the bowl of a stand mixer fitted with the whisk attachment, whip the remaining 1 cup heavy cream at medium speed until it begins to thicken, about 30 seconds. Increase the speed to high and whip until soft peaks form when the whisk is lifted, 15 to 60 seconds. Gently whisk one-third of the whipped cream into the white chocolate mixture to lighten. Using a rubber spatula, fold the remaining whipped cream into the white chocolate mixture until no white streaks remain. Spoon the white chocolate mousse into the pan over the middle layer. Smooth the top with an offset spatula. Return the cake to the refrigerator and chill until set, at least 2½ hours. Kinda wishing I was your daughter Sarah right now :) Best wishes to her for a wonderful year. Beautiful looking cake.